For those of you wondering about all these extra posts I'm putting up this week, allow me to explain. No, no, there is too much. Let me "sum up." 1. 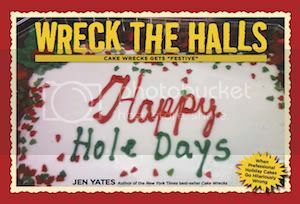 John and I are on a book tour for Cake Wrecks, the book. 2. Uh...actually, that's about it. Actually, what's happened here is that long bouts of uncontrollable laughter have rendered everyone nearly catatonic with pleasure. [polishing fingernails] Yep, me and John, we have what you might call "the gift." This one made me laugh; I love the French butterfly! A rodeo carrot jockey. Excellent. You can see all of the entries in the Facebook album here. And one last thing: I'd like to apologize to the last 20 or so of you in the signing line that night; we had to rush because the store was closing (well, had been closed for 25 minutes, actually) and so we didn't get the chance to chat with you as much as we wanted to. I'm very sorry about that, and I hope you each still had fun! PRINCESS BRIDE REFRENCE!! Could I love this site anymore? I thought not... I know the correct answer now. Bonus points for the Princess Bride reference at the beginning! I discovered your blog only a few days ago and can't remember the last time I laughed so much. I love your clever wit (and the occasional quote from the Princess Bride). As a former professional cake decorator myself I can't BELIEVE those cakes! Thanks for making the world a happier place! Yay for Princess Bride references! Yay for Princess Bride quotes!!! it was so much fun getting to meet you and John at The Tattered Cover! Come back anytime!!!!!!!! The carrot bustin' baby in a cowboy hat just adds a whole new dimension, doesn't it? Ha! Great post for a great tour! You got a mention in Australia! I have to call all my friends and tell them I'm on cake wrecks! (Me, near the back- yeah zoom in.) Glad you both came, I blogged your book tour yesterday. Aww, I really wish you guys were coming out to my area... these signings look like so much fun! congrats on the tour lookin so amazing - my favorite part is looking at the cupcake replicas - priceless and ppl are putting so much work into them!!! :) awesome! I see that this has already been said but...yay Princess Bride!!! This blog inspires me to eat cake. How do you not get incredibly fat running this Web site and doing this tour? not getting fat by eating the pretty ones only rite? That green sailor guy is Kai! Kai is a green blob like frog puppet that is part of a show in Denmark called Kai and Andrea. The best thing about the cakes (at least in Denmark) is that when you bit into them they have red jelly in the inside. It freaked me out!! Yes, The Princess Bride is what made it for me as well. Dang! I can't believe it missed this! I would totally have had to blow off my DD's marching band competition, but I think she would have understood. Cake Wrecks rules! Thank you for the unexpected Princess Bride reference, you totally turned my morning around! Initially I read "signing line" as "singing line" and really wondered what I was missing out on! I just want you to know that not only is your site -highly- entertaining and wonderfully written, but it gets better late at night. Thank you for the laughs, I hope to lurk my local bakery with a camera soon! When are those cursed with jobs that won't permit leave going to be blessed with photos of the immensely talented and hilarious Mr. & Mrs. Cake Wreck? Preferably posed around a Naked Mohawk Baby Carrot Jockey, but that may be asking too much. Thanks, carry on. And enjoy the DFW area - while I slave away at work. We definitely don't believe in oxygen here in Denver. I know the crowds can be a little mellow but the lack of oxygen makes it hard to be anything but mellow. It's a natural high. I ♥ Tattered Cover!!! What a great place to promote your new book, Jen! Extra points for the Princess Bride reference! Because I'm a total Princess Bride Junkie...I just have to tell "kjl" that his name is INIGO with no d. :) That being said, things at my house are always planned for "in-a little less-a half-a hour"
Princess Bride, Three Amigos, Star Wars, Star Trek, /bow you are the queen. I <3 Inigo! Keep up the good work. That ET cake, makes him look like he was covered in band aids, did his ship burn up? i don't remember what happened in the movie! who can follow that one up? love this site...so happy for your success! Thank you for the Princess Bride Reference! I love the bat on Dominick's cake, it's like he's about to say "Hey, don't blame me, I didn't want to be on this thing anyway!" What do you mean ONE guy to look excited? There is a second guy in the back left corner waving away!! I think the ET should have won. Love it! Hey! Sorry I missed you in Denver - I'm a huge fan of your site (do another signing here...I know you want to). I used to be a baker, and I've seen cakes that still make me wake up in the middle of the night in a cold sweat. Thanks for keeping us laughing! I caught the Inigo quote!! Yay!! !